It's awesome that you're able to brush your cat's teeth! My dogs won't have it LOL! Oral health is so important and I have to admit since Pierre got so sick I have been hard-pressed to brush his teeth as often as I had been. His stomach is so sensitive. I do brush them but use less toothpaste. Bentley LOVES brushing. It amazes me that Bentley loves having his teeth brushed! Poor Pierre having such a sensitive stomach. I can't brush my dogs' teeth for beans! They hate it. I love using the water additive, it's such an easy way to provide oral care daily. 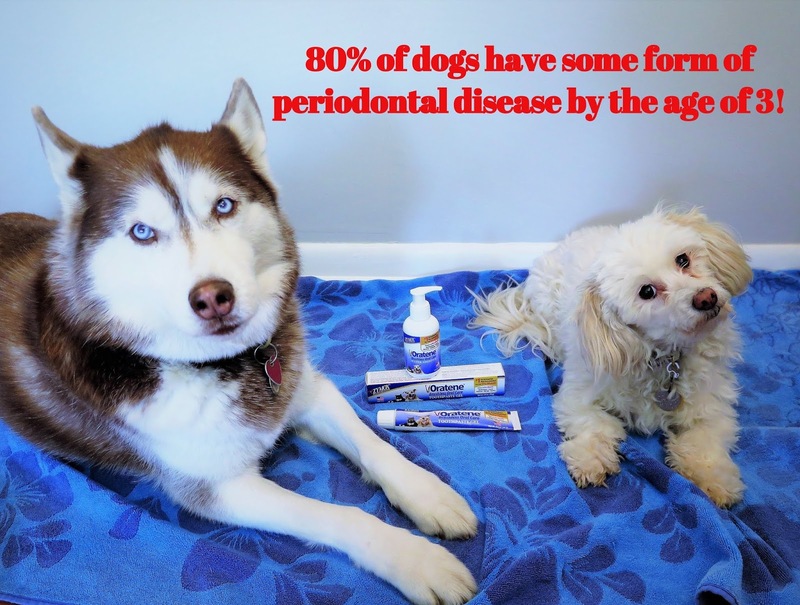 My dogs have pretty healthy teeth, they have used a water additive to help keep them healthy. That's awesome Beth! I love the water additive. It's such an easy thing to do daily and the dogs don't even know it's in their water. Great post, and we know not enough can ever be written about oral care. 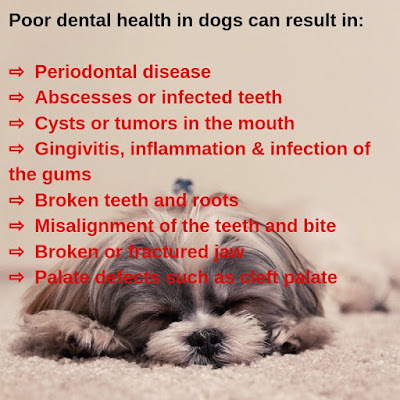 I hear so many stories from people who have old dogs whose teeth are really bad, and I'm always encouraging them to see the vet, and start some kind of oral hygiene routine. For the difficult dogs like mine, a brushless system is ideal. Entered the contest!! Thank you Hindy! Older dogs often have health problems related to poor oral hygiene if they've never had any care for years. I love these brushless products! We entered the giveaway, thank you for that. I didn't know that Zymox made dental health products! That's awesome. I've been using their ear drops for years, for my older dog who is prone to ear infections. I actually do brush my dogs' teeth, but I'll have to check out the Zymox products anyways. I'm sure it wouldn't hurt to use them in addition to our current teeth care protocol. Thanks for entering our giveaway! I love Zymox products, I use their ear cleaner, shampoo & conditioning rinse, and the oral care products. I love them! Both dogs have visited the veterinarian for check ups this month and were given a very good rating on their teeth! Of course, my vet was disappointed that I don't regularly brush them. So I love the idea of the brushless system by Oratene. Zymox products are amazing! It's great that they had a good checkup! My dogs won't tolerate brushing either, so these brushless products are perfect. Cookie's teeth had been holding up really well. We did brushing with Jasmine and JD but that alone didn't seem enough. Cookie gets her teeth brushed as well as she gets raw meaty bones--that seems to be the magic combination. Hooray for Cookie! It's great that you can brush her teeth, that's wonderful. The bones are helpful too. I gave Icy raw bone recently but she chewed it up so much that it had sharp raw edges so I got rid of it. I love these easy to use products. I'm just dumbfounded that the stats for dental disease is so high in cats AND dogs! 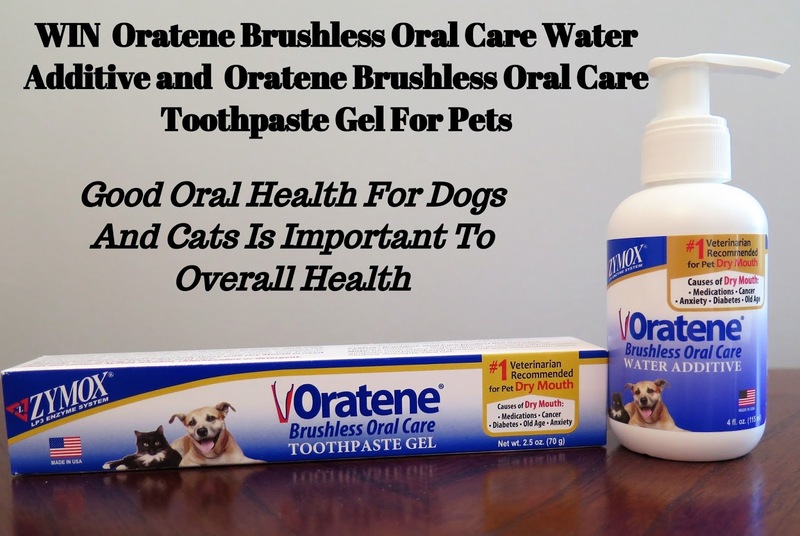 This is a fantastic giveaway for pet parents to help keep their pets teeth healthy. Will share too! I love them too! 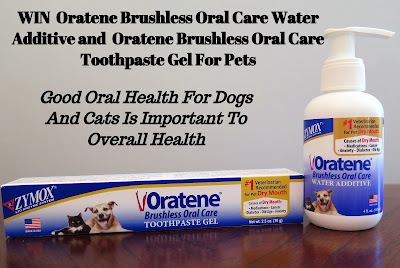 It was so disheartening when I couldn't brush the dogs' teeth but these products really help. I'm glad I found them. Thanks for sharing our giveaway, much appreciated! Zymox products are the best. I use their shampoo and conditioner all winter long with Plush for itchy winter dry skin, and I've used their ear drops too. I have tried that water additive, we got free trials when I ran a pet store. It is great stuff, I'd love to win the giveaway. I love Zymox products, I use these dental products, their shampoo & conditioning rinse, their topical ointment, and their ear cleaner. I'm a big fan! Oh definitely give it a try so you can keep Kilo's teeth healthy. These two products are easy to use so I bet Kilo won't mind them at all! Apparently according to one vet Natasha needed a dental (expensive) so we tried another vet. her teeth aren't perfect but they are fine for now. So I think I need this stuff to arm myself against dodgy vets! That's weird, I'm shocked a Vet would recommend a cleaning if it wasn't really needed. Not only is it expensive but pets must be put under anesthesia to do it - that's not something to take so lightly. Oratene would definitely help Natasha! I've been extremely lucky with my cats and their dental health. They do get regular checkups at the veterinarian and have cleanings, when needed. I haven't done anything with brushing their teeth although I know I should. I'm glad your cats don't have dental issues. Dental cleanings are great, but I worry about them having to be put under to do them. The water additive is the simplest tool I think. Wonderful post! My Sibes are funny about their teeth being "brushed" (I use the finger brushes)...they love the doggy toothpaste, especially mint! With all four of mine now seniors, I, too, see the decline in the condition of their teeth, particularly the color. Miss their bright pearly whites! I really like the idea of the water additive. Thanks Dorothy! You're lucky you can get a finger brush in their mouths, my girls hate that. The water additive is great and the gel is something they'll at least let me do LOL! I brush my pet's teeth and provide my pet with dental toys. That's awesome, Cassandra! I wish I could brush my dogs' teeth but they hate it. Thank you! Contact details for most blogs can be found in the About Me tab on the Home page. It's really amazing blog post for pet. I appreciate the way in which you are described it. Thanks!